Watch the sky streak with the most brilliant orange complimenting perfectly with hues of red and crimson, with hints of blue still lingering in the clouds. As the sun sets behind the horizon, the amazing colours battle with each other pushing away the blackness. The water gleam in the last rays of the sun. As you watch the waves softly lapping on the beach, sip a Pina colada, and enjoy the aroma of fresh sea food, caught during the day and cooked at night waft through the air. Sobre Las Olas was built to heighten your senses. 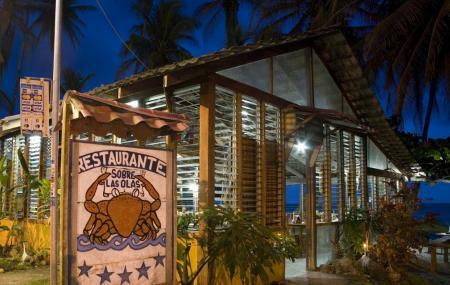 The restaurant is situated on the edge of the coral reef overlooking the stunning coastline of Cahuita. There are seats on the beach nestled between palm trees and hammocks to swing from while appetisers such as spicy mussels, and ceviche are served as appetisers. Flavours of the food served here reflect the fusion of Costa Rican food with Italian, union of husband and wife who run this restaurant. The wide display of cuisine is astonishing. Well-cooked tender fish steaks fall off the bone. Ranging from langouste, lobsters with fries, swordfish cappachio, fish and chips, spaghetti in mixed seafood, rice with Cameroons, ratatouille, avocado salad, to chocolate cakes and tiramisu, the list is endless. And to top that the chef will prepare food as per your requirements, thus chicken and steak is also on the menu. A generous sprinkling of fresh basil does wonders to the meals. This restaurant has a bar so all meals are accompanied with a beverage of your choice. The staff are very attentive and cater to your whims. The portion of every meal is very fulfilling and sitting on the waves and enjoying a hearty meal is truly magical. During the day, a sturdy horse will walk into the water with you riding on it, an experience you will not forget! There is a sloth in residence as well! When the tide is high, it’s safer to sit in the restaurant since the beach is so close to the waterfront. If there is a preference to food, it’s better to inform in advance. Food is prepared with fresh catch so breakfast is not on the menu. How popular is Sobre Las Olas? People normally club together Pizzeria Cahuita and Coco's Bar while planning their visit to Sobre Las Olas. Perfect view near the water with amazing food. The seafood is fresh and well seasoned. The restaurant is in the middle to upper price range. Great for seafood, and right next to the beach. Eat outdoors if it's not raining. Lighting fast service, but pricey by Costa Rica standards. Large portions, though, well cooked. In the US this is what we would call a "greasy spoon". The facilities are rough but the food is outstanding. We sat outside just steps from the surf. We ate their twice in 2 weeks and agreed that we would eat there regularly if we had the chance. The Garlic Octopus is amazing. So is the Shrimp, Red Snapper, and the fresh steamed vegtables. You won't regret stopping here. I had the Caribbean style fish with fries, everything was so fresh and tasty, even the fries were amazing (hand cut with skin on, not deep fried which was nice). Beautiful setting to eat with ocean views outside, great service. Couldn't ask for better! First of all I will give a compliment to the service. It was very very friendly and quick! The menue was fantastic. We had the catch of the day with Caribbean sauce and the grilled chicken breast. Both were very juicy and delicious! I think it is the best restaurant in town! Great job guys!